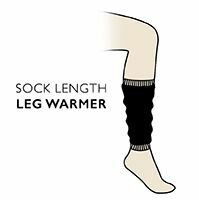 Leg warmers are just classic dance and exercise wear, warming and versatile. These ToeSox Sasha Over The Knee Open Foot Slouch Socks are made for any and all floor disciplines - Pilates, barre and dance - or of course, you can just wear them for fashion - feel free! These super soft, ribbed pelerine pattern, organic cotton rich items can be worn thigh high or slouched over the knee. The detailed tops have a gorgeous, flattering fanned welt design and the bottom cuffs are gentle and comfortable. A ToeSox metal tag decorates the side of the cuff.